Nutrition professionals speak out about recent accusations that the Academy of Nutrition and Dietetics wants to prevent unlicensed dietitians and nutritionists from providing nutrition counseling. While most states have had nutrition licensure in place for more than 20 years, mandating that only licensed dietetics professionals can provide nutrition counseling, recent events have led to widely publicized accusations that the Academy of Nutrition and Dietetics (the Academy) is using state legislatures to block unlicensed nutrition providers, including those with advanced degrees and certifications in nutrition, from practicing nutrition counseling. Licensure, according to the Academy, is intended to protect public health. Those opposed believe these laws are an attempt by the Academy to limit competition among its RD members, which will deny the public access to and choice of nutrition therapy. What might have remained a quiet, albeit contentious, issue between RDs and non-RDs has gone public thanks to North Carolina blogger Steve Cooksey. Known as the “Paleo Blogger,” the North Carolina Board of Dietetics/Nutrition told Cooksey that the health and nutrition content on his blog was considered nutrition counseling, which is illegal in that state without a license. The board outlined a series of changes Cooksey would have to make to his blog or face arrest. Cyberword spread, and bloggers across the nation—many of whom were doing the same thing as Cooksey—were outraged by what they viewed as a violation of free speech, and the Academy’s actions were thrust under public scrutiny and outrage. Enter Forbes magazine’s online coverage, and the issue went viral.1 Forbes contributor Michael Ellsberg reported that the Academy was intentionally using state legislatures for the sole purpose of limiting market competition in nutrition counseling for RDs, with no intent toward protecting public health. He referred to an internal Academy document,2 now published on the Alliance for Natural Health website, that he says someone from the Academy “leaked.” The document, dated fall 2011, focuses on the importance of licensure and states that the intention of the dietetics profession is to be “identified as the preferred and qualified provider of nutrition services. Licensing of dietitians protects the public health by establishing minimum educational and experience criteria for those individuals who hold themselves out to be experts in food and nutrition.” Public safety is mentioned throughout the document as well as competition and how to manage it. Perhaps the most controversial topic in the Forbes article was the April 15 “Reporting Harm” document from the Academy.3 It places responsibility on the RD to report those practicing without a license and who are potentially harming people medically or financially. Interpreted as a witch hunt by Ellsberg, he purports this type of “spying” strengthens his case that the Academy is aggressively out to limit competition for RDs. Tuma’s letter to Ellsberg makes it clear that no one is restricted from providing what the Academy’s Model Practice Act defines as “general non-medical nutrition information,” whether yoga instructor, personal trainer, or acupuncturist. Tuma also makes it clear that licensure doesn’t “prohibit licensed chiropractors, pharmacists, nurses, personal trainers, or acupuncturists from providing nutritional counseling,” and that the “Academy supports both member and non-member PhD nutritionists’ work.” The letter concludes by emphasizing that it’s the Academy’s goal to protect the public from incompetent practitioners. This doesn’t mean consumers shouldn’t seek the advice of those with nutrition backgrounds; in fact, according to Tuma, it’s encouraged. The line is drawn, however, when nutrition advice becomes medical nutrition therapy, the therapeutic approach to treating medical conditions and their symptoms through a specific diet. 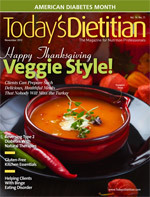 Once a medical condition is involved, Tuma says that “the danger posed by the unqualified provision of medical nutrition therapy cannot be understated,” and just as there are licensed physicians and dentists, whose license ensures they’ve met a rigorous set of standards, so should there be licensed dietitians. According to Rifkin, there are many unlicensed violators claiming to be experts and peddling what he calls “magic potions and powders.” In Maryland a patient was harmed and killed by the recommendations of an unlicensed violator in 2005.4 The type 1 diabetes patient sought the services of a fasting practitioner who stopped the patient’s insulin completely and then stopped her food intake. The patient was dead within a week. Though the practitioner was issued public cease and desist orders and fined, he still may be practicing without a license in another state or country. Licensure laws also are meant to ensure that those who have met the set of standards to become an RD abide by the code of conduct, Tuma says. There are several examples of violations against incompetent providers, such as the licensed RD in Ohio who was convicted of prescribing, selling, and administering drugs in her practice that caused pain and injury to her patients or an applicant for a dietitian license who misrepresented information on the license application, which an investigation found to be felony misconduct. Her license was denied. There are some extreme cases of people harmed by unlicensed practitioners, but Rifkin believes most of the harm done goes unreported because people don’t know how or where to report bad experiences. Lauren Schmitt, RD, a nutritionist and certified personal trainer in California, has seen many such cases. Many of her clients have personal trainers who give out what Schmitt calls nutrition misinformation that confuses people. In the gym setting, advice about carbohydrates and protein are good examples. The law is so far behind when it comes to both public perception and technology, Rifkin explains. “[The law requires] a more aggressive application because there’s more aggression out there” in terms of people wanting to jump in and make nutrition a business venture. As a result, there are many credentials and certificates, both authentic and contrived, along with their corresponding titles, creating confusion for the public. It’s up to each state to determine who’s qualified depending on its level of regulation. There are three levels of state regulation for dietitians and nutritionists: licensing, statutory certification, and registration. Licensing is the most defined and makes practicing without a state license illegal. Certification is less explicit in that it limits certain titles to individuals who meet specific requirements, but those who aren’t certified may still practice the profession. Registration, the least restrictive of the three, permits unregistered individuals to practice the profession, requires no exam, and is minimally enforced. Currently, most states regulate dietetics and nutrition, but the Academy is pushing for licensure in all 50 states. The certified nutrition specialist (CNS) is the only credential other than the RD accepted under the licensing laws in some states. Currently, there are 12 US states and territories that accept the CNS credential or exam. The standards for this credential include an advanced degree in nutrition, regionally accredited nutrition education, 1,000 hours of supervised experience, and a rigorous exam in science-based clinical nutrition. Corinne Bush, MS, CNS, chair of the outreach/legislative committee for the Certification Board for Nutrition Specialists (CBNS), would be barred from practicing if the licensure bill introduced in New Jersey earlier this year passes. The bill is an exclusive scope of practice bill, which means anyone without an RD credential can’t be licensed, and practicing without a license would be criminalized. Bush believes licensing can be done well if it optimizes public health by informing the public of a practitioner’s education, experience, and knowledge. As it is, she doesn’t believe this is happening. Coco Newton, MPH, RD, CCN, a dietitian with dual registration/certification, agrees there’s more than one route to becoming a nutritionist. Newton, whose colleagues include dietitians, naturopaths, certified clinical nutritionists (CCN), CNSs, and others with various other nutrition credentials and certifications, is a long-time advocate for the rights of non-RD nutritionists. She testified to the Michigan House Health Policy Committee in 2006 against an RD-only licensure bill and helped draft a substitute bill that was passed into law and included language that might allow other nutritionists to qualify. In the 1970s and 1980s, the RD community impressed on its members that if you weren’t an RD, you were a charlatan or a quack, Newton says. She, too, believed that RDs were the only ones qualified to practice dietetics and nutrition, the only experts. It wasn’t until a family illness drove her to seek out different types of practitioners that her opinion began to change and she started exploring alternative routes to practice nutrition. What she learned is that she had much to learn. “I went for my CCN and felt so inadequate, unprepared, almost lame as a dietitian,” she says. “I had no education except the dietetics version of nutrition. I had to expand.” And she did. While earning her CCN, CNS, and other credentials, she discovered that most of her fellow students already were pharmacists, MDs, nurses, and other highly trained professionals who wanted to include nutrition in their expertise. This was the case for Newton’s colleague Liz Lipski, PhD, CCN, CHN, founder of Innovative Healing. Lipski’s advanced degrees in nutrition, 30 years of clinical nutrition practice, and training of MDs, dietitians, nutritionists, and other healthcare professionals to use clinical nutrition in their practices wasn’t sufficient to be licensed by the North Carolina Board of Dietetics/Nutrition. Rather than return to school at the undergrad level to earn the requirements, Lipski moved to Georgia where she could continue practicing nutrition. This doesn’t fare well for the Academy in its goal to establish RDs as the nutrition experts without a concerted effort to educate the public. Many in the nutrition profession—RDs as well as non-RDs—would like to see the Academy modify its image to accommodate people’s new views and philosophies and, as Newton believes, “morph into something more representative” of the widening array of qualified nutrition professionals. 1. Ellsberg M. Is the ADA intentionally using state legislatures to block alternative nutrition providers? Forbes website. http://www.forbes.com/sites/michaelellsberg/2012/07/10/american_dietetic_association_2/. July 10, 2012. 2. American Dietetic Association. Licensure: HOD backgrounder. Alliance for Natural Health USA website. http://www.reallyeatright.org/wp-content/uploads/2012/05/HOD-Licensure-Backgrounder-2011-07-22-11.pdf. Fall 2011. 3. Mavko K. Reporting harm: who, what, when, where, why and how? Alliance for Natural Health USA website. http://www.reallyeatright.org/wp-content/uploads/2012/07/Reporting-Harm-StateIssues_WorkshopA_Handout.pdf. April 15, 2012.